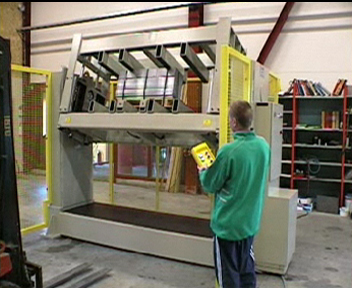 Blank stack turners do have the task to turn complete stacks of blanks by 180°. Reasons for turning of stacks of blanks usually are caused by the production process and a correct position of the blanks within the stack can not be planned in advance. personnel. Finally the risk of material damage in case of manual turning is much bigger than in case of automised turning by turning station. Basing on standardised base versions with suitable dimensions and with suitable load capacity Turning Stations for stacks of blanks always are designed customer-specifically. You are looking for a possibility to turn your stacks of blanks safely, quickly and reliably? Please let us have your requirement regarding a stack turner. We would like to check your request and to offer to you a suitable installation.